Fancy a short break this Winter? Then why not take advantage of our Winter Offer, just £127.50 for a 2 night stay for 2 in a Twin or Double Room, including full Breakfast each morning. Phone or Book Online and Quote 'ACORN2'. 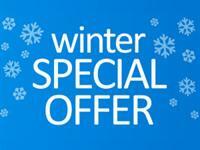 2 Night Stay for 3 people in our Triple or Family Room, just £191.40 Including full Breakfast each morning. 2 Night Stay for 4 people in our Family Room, just £230.00 including full Breakfast each morning.